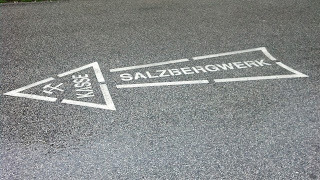 On May 30th we had our last day in Salzburg. We had decided to spend the day in Berchtesgaden since there are a lot of things to do there like the Eagle's Nest, Salt Mines, Nazi Documentation Center and the Konigssee Lake district. Looking ahead at the weather it seemed it would be a rainy day so we figured we could do the Salt Mines and the Documentation Center which were both indoor (or underground) activities. I think the Lake district would have been our choice to visit and have lunch there if the weather had been nice. We found out upon our arrival in Salzburg that May 30th was a Catholic Holiday and many things in town would be closed and buses would be on an abbreviated schedule but that all the attractions in Berchtesgaden would be open. 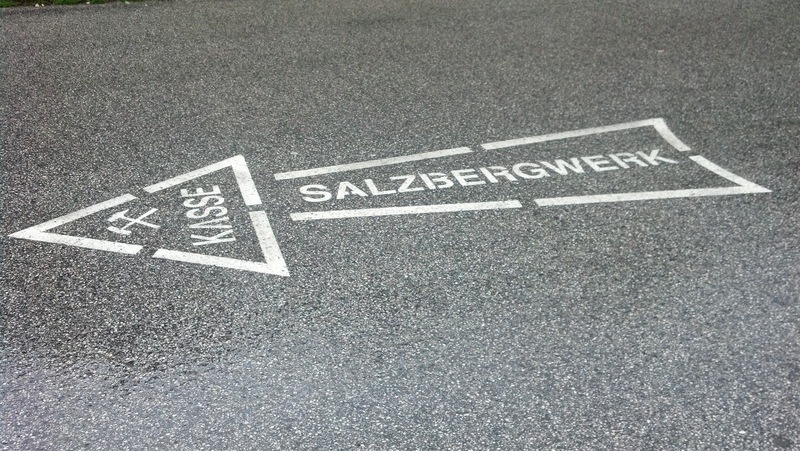 We left in the morning and took the bus into the Salzburg city center and boarded another bus to Berchtesgaden. 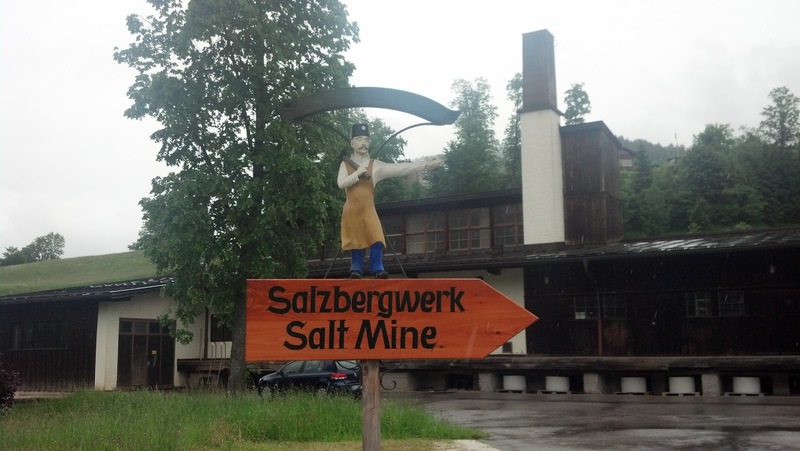 We got off at the stop for the Salt Mines and after searching around for a few minutes in the rain found the sign pointing to the Salt Mines. We also tried to check when the bus would be back and going in the direction of the Documentation Center but couldn't find any information on the holiday schedule. 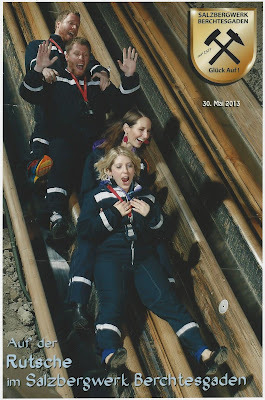 We arrived at the Salt Mines and bought the next soonest tour that was available. We had to wait about 45 minutes. We thought about buying a later afternoon tour and going to the Documentation Center first and then coming back but we didn't want to risk that without knowing the bus schedule. 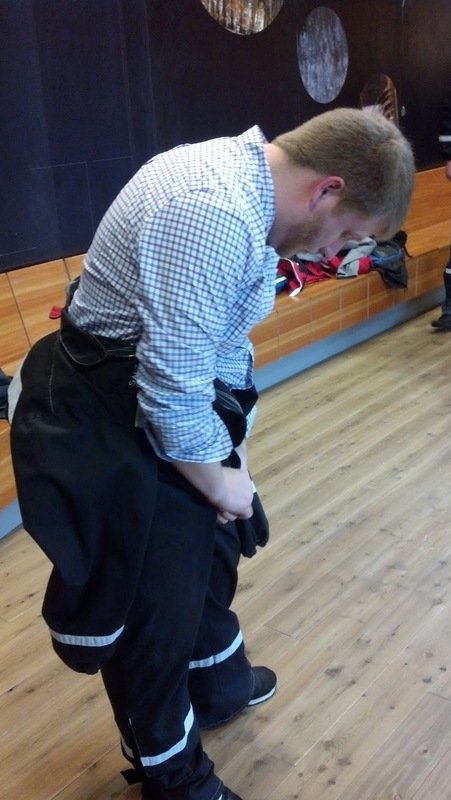 While you wait for the tour you put on these jumpsuits over your clothes. We had a great time taking photos in our jumpsuits. My mom actually did the very same tour when she was a girl living in Europe when my granddad was stationed in France in the army. They took a family vacation and she remembers the Salt Mine tour and shared this picture with me from 1962. They wore jumpsuits too... I'm glad to see they aren't still using the very same jumpsuits. They are near the middle of the photo with my grandparents heads leaning toward each other (grandmommy in front of my granddad) and my mom (with bangs) is below my granddad. 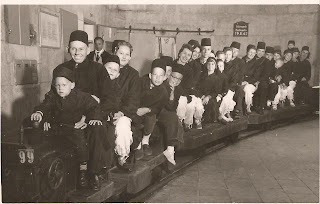 They load you onto those little trains like you see in the photo that take you on tracks deep into the cold dark mine. You have an audio guide that you are listening to for the English tour (or other languages besides German) as well as a guide but he doesn't speak much English, only German. You get off the train and the guide walks you through various parts of the mine while the audio guide explains all about the salt mining process, the mine itself and the job of a salt miner. It was all very interesting. I cannot imagine working in such dark and cold conditions but I guess they never get overheated or sunburned like jobs working outside. At a couple of points in the tour you get to go down these slides to take you from one area of the mine to the next area as part of the tour. That was super fun! You slide pretty fast as a group wearing those jumpsuits. They take your photo which is available after the tour (for purchase of course). At the end of the tour everyone gets a very small travel sized container of salt from the mine. And you return your jumpsuits near the ticket area. We saw it was still raining and we were getting hungry as it was after lunchtime so we decided to walk into the downtown to get lunch. A lady in the salt mine office said it was about a 15 minute walk. Well it was more like a 25 minute walk... I'm sure due to the cold rain we weren't walking quite as fast as without rain but still. And she failed to mention that everything and I mean everything was closed. We went up to probably 10 different restaurants and all of them were either closed for the holiday or closed until dinner time (it was going on 2pm by that time). We finally found a tourist information center right by a big bus stop in town. We went inside to get some snacks at a convenience area and inquired about restaurants and the documentation center. We found out that due to the reduced bus schedule we would not have time to go to the documentation center and get back before the last bus back to Salzburg left. So at this point we decided just to take the next bus back to Salzburg instead and eat our snacks. On the bus ride back we decided we would take the bus to the main train station so we could pick up some groceries for dinner to go with our delicious Italian leftovers from Pizzeria Beccofino the previous night. On holidays, in the city area only the main grocery at the train station is open. Good thing we had those as I'm sure the restaurants open would be limited and to be honest with the nasty weather we were glad to just have a dinner in the apartment. We picked up food for a nice salad to go with dinner and some cheeses and hummus and chips and crackers to have as soon as we got home due to our lack of lunch. We grabbed some beer and wine too. 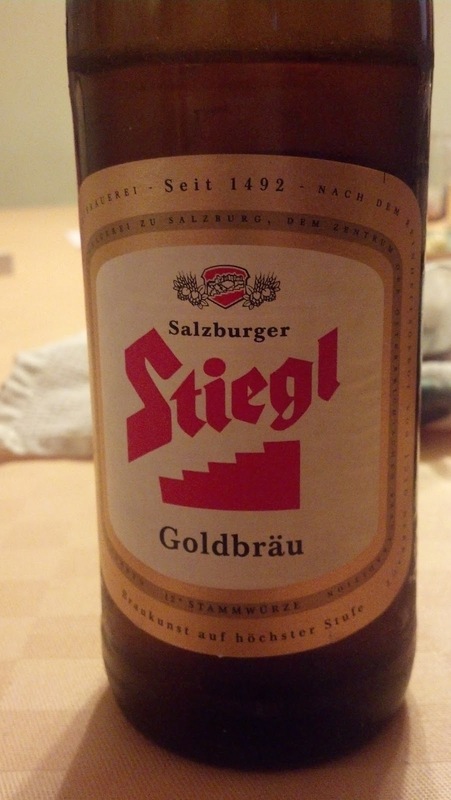 Stiegl was Eric's favorite beer during our Europe trip. It was also the boys favorite beer to pronounce in a strange burly man-like accent. We took the bus back to the apartment stop and walked home. We had a nice evening eating and drinking and painting our nails (Megan and I that is) and planning out our next day when we would travel to Vienna.